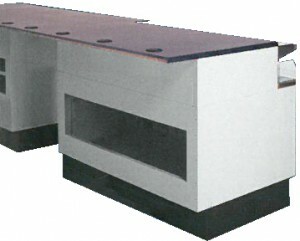 Welded construction heavy duty metal cabinets. Built to support the weight of heavy foodservice and dispensing equipment. 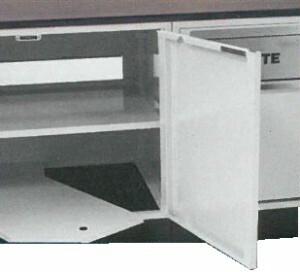 Units feature stainless steel tops for food prep. Utility cutouts for electrical and plumbing standard in tops and bodies. 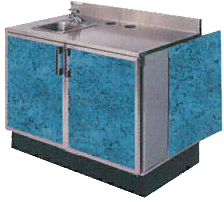 Available with hand sinks and other drop in foodservice equipment. Standard lengths include 12", 24", 36", 48", 60" and 72", 30" and 36" depths. 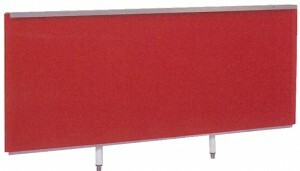 All units feature removable laminate panels for replacement and quick and easy décor changes. 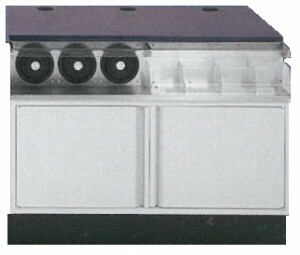 48" refrigerated base model for expanded cold storage. 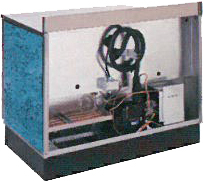 Refrigerated models feature rear mounted easy access mechanical refrigeration. Air filter pulls out from ventilated kick plate for easy cleaning. 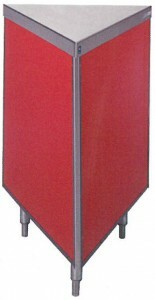 These modular powder coated cabinets are available in a wide range of sizes and styles. 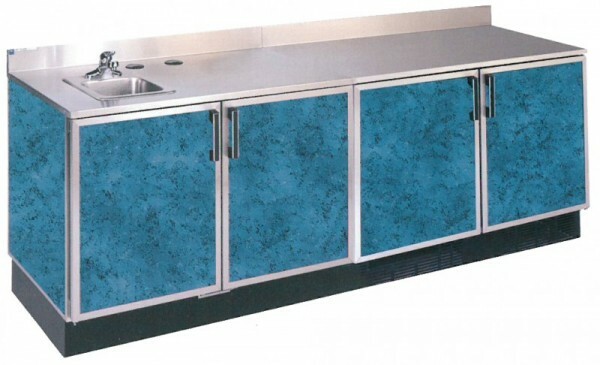 Work tops can be stainless steel, laminate, solid surface, Corian and virtually any other surfacing material. Modules are easily bolted together to develop a versatile flexible line up. 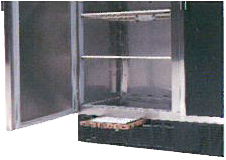 Metal construction designed to support the weight of food service and dispensing equipment. Cabinet backs cut out for plumbing and electrical access. Tops overhang bodies to create utility raceways. Cup dispensers and condiment holders available. Adjustable intermediate shelves and removable bottom shelves for access to leveling feet hidden inside of cabinet. 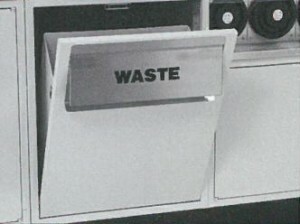 Tilt out waste units make access simple and clean. Cabinet backs cut out for plumbing and electrical access. Top overhang bodies to create utility raceways. 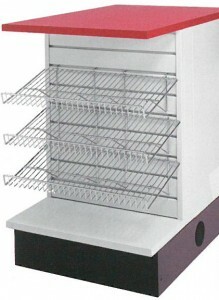 Add slat walls with wire racks to expand merchandising space on any counter. Select from standard wedges or design special transition pieces to accommodate virtually any store layout. 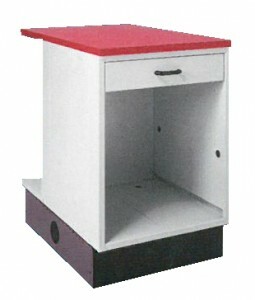 Filler cabinet provide the ability to match any counter length to any special store layout requirements. Storage and Cashier drawers add utility to any counter. 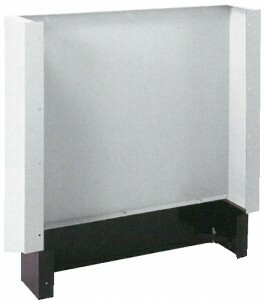 Cup dispensers can be mounted in cabinets for operator service or self-service applications. 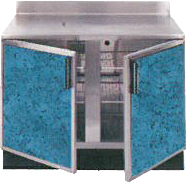 Knee walls for placement in front of food preparation or other equipment. Open Stores Faster: Production of standard components from one manufacturer with worldwide distribution eliminates the need to coordinate a number of custom millwork manufacturers.